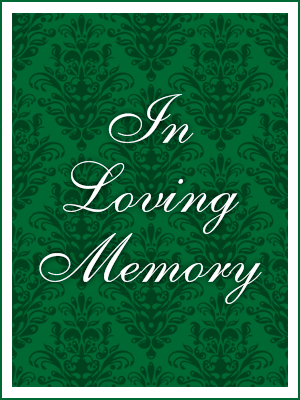 Anna M. Lavelle, age 94, passed away on July 4, 2017 at Eger Nursing Home, surrounded by her loving family. She is predeceased by her loving husband, John Lavelle who passed away in 2001. Anna is survived by her beloved daughter, Maureen Carcione and her 3 loving sons, John M. Lavelle, James Lavelle and Joseph Lavelle. She is also survived by 8 grandchildren and 6 great grandchildren. She enjoyed listening to Irish music as well as singing, dancing and painting. She will be dearly missed by her family and friends. Funeral services will be held at Cherubini McInerney Funeral Home, (formally Meislohn-Silvie) 1289 Forest Avenue, on Saturday at 9:45am at St. Clare’s Church, then a burial at Resurrection Cemetery. Friends are invited to call on Friday 2-4pm and 7-9pm. In lieu of flowers the following donations would be greatly appreciated to St. Jude’s Children’s Hospital, 220 E 42nd St, New York, NY 10017 and/or Eger Nursing Home, 140 Meisner Ave, Staten Island, NY 10306.